This is a Poster. It is dated ca. 1989 and we acquired it in 1993. Its medium is support: paper. It is a part of the Drawings, Prints, and Graphic Design department. This object was donated by Unknown donor: found in Collection and catalogued by Megan L. Smith. It is credited Gift of Unknown Donor. Signed in blue ink at lower right: Dianne H. Pilgrim/David R. McFadden. 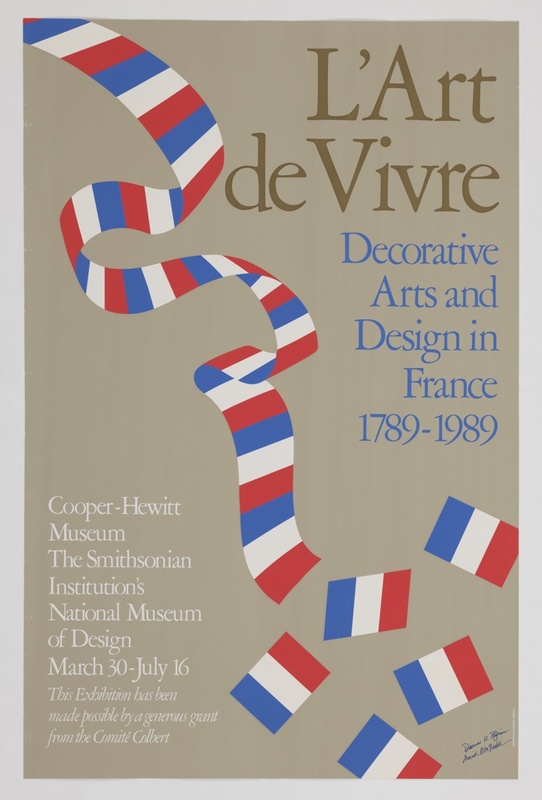 Imprinted in olive green at upper right: L'Art/de Vivre; in blue at upper center: Decorative/Arts and/Design in/France/1789-1989; in white at lower left: Cooper-Hewitt/Museum/The Smithsonian/Institution's/National Museum/ of Design/March 30-July 16/This Exhibition has been/made possible by a generous grant/from the Comite Colbert.